1:54 Contemporary African Art Fair (October 5-8th) Somerset House, London: Pictorial Highlights (several artists) and video ‘My Rock stars’ (at bottom) by artist Hassan Hajjaj, featuring some of the artists in his ‘La Caravane’ exhibition. Chimamanda Ngozi Ndichi in London; celebrates motherhood and the 10th anniversary of ‘Half of a Yellow Sun’, with her fans. Tyron Mulinde buried in the UK and not Uganda: Aggrieved Father absent at funeral because son desired to be buried in Uganda. Ugandan of the Year: Inventor of Top Notch Cooking Stove that removes the hassle out of cooking (domestic and commercial). Ugandan poet wins $10,000 Wole Soyinka Prize for Literature in Africa. Rejected: Ugandan UK father’s desire to bury son in Uganda denied. UK Coroner’s communication to Sam Mulinde, father to Tyrone. Burial dispute: Ugandan father denied by UK Coroner, chance to bury son in Uganda. Ugandan Contestant is Miss World Africa.Quinn Abenakyo makes History as first Ugandan top finalist. UGANDA DECLARES NATIONAL DAY OF MOURNING FOR BOAT CRUISE VICTIMS: Friday 30th November 2018. Uganda: Winner of Excellence Family Planning Award at international conference. Rwanda hosting international conference on family planning: $350m committed by donors in family planning funding.3500 delegates including 500+ youth in attendance (12th-15th November). 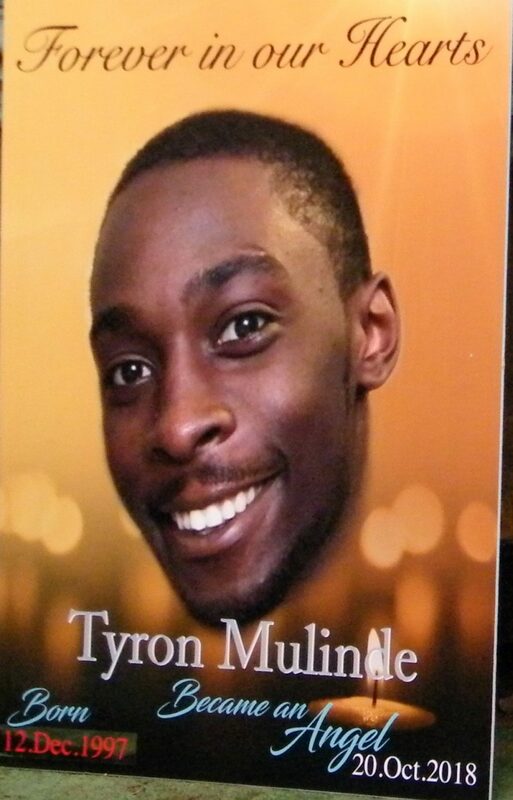 Tyrone Mulinde Funeral Service: This Saturday (November 10th 2018). Fundraising applauded by family who appeal for more to raise £15000 total. Free eye treatment in Uganda to be scaled through collaborative UK and Uganda projects. 800 UK specialists volunteer to assist at eye camps for the poor. Peter Herbert OBE (Senior Black Judge) speaking about racial bias against Black people, in Britain’s criminal justice system, as confirmed in Lammy Review. Free Bobi Wine London demonstration (pictorial) Courtesy photos. Besigye personifies Museveni as the “budget of Uganda”. “He (Museveni) is the budget. Whatever amount he orders, he gets”. Betty Nambooze Torture: Boris Johnson (Britain’s Secretary of State) receives complaint letter. Uganda’s UK Ambassador Requests Ambulance Donation from UK Health Partners. President Paul Kagame; African Union’s New Chair-2018. Third Chair from East Africa since the AU’s establishment in 2001. African Union Passport Unveiled as Uganda loses $1m in failed ‘Specioza Kazibwe bid’…for African Union Chair. Robert Mugabe: Why the western media cried more than the bereaved and equated Mugabe to a country. Wole Soyinka on negritude (video of his full address within article) as reviewed after the June 1962 Makerere African Writers Conference, where it was attacked. Faces of London’s stabbed young victims as seen at peace march against violent crime. Uganda Government and UK-Uganda Community leaders condemn fatal knife stabbings of Ugandans in the UK: “Enough is Enough”. Black People ‘Imprisoned Most and Die Most’ in Britain’s Racially Biased Criminal Justice System. Nancy Kacungira Honoured as first Komla Dumor Award Winner; Her Remarks at the Event at BBC Offices in London. UK-East African Healthcare Summit in Pictures. Expelled out of the United Arab Emirates for life: A Ugandan Journalist Who Exposed the Darker Side of United Arab Emirates (UAE). Murdered Ugandan British girl, Elizabeth Nnyanzi, for final rest in Uganda (13th March 1984-14th August 2015). Two Ugandan biomedical engineers (one..being a UK based Ugandan Clinical Scientist that has helped with training biomedical engineers in Uganda) speak on the status of medical equipment in Ugandan hospitals and how the second hand equipment…is prevented from breaking down. ‘Lost, My Battle with Depression’: (Author Doris Allimadi on how she overcame depression). $100,000 donation to Ugandan rural hospitals by Ugandan-Asian in London; “People in Uganda are suffering, people are in pain”, Lord Popat. The Katikkiro explains federo to Baganda in London. Pictorial: London African Cultural Celebration Event. Kanye West’s visit to Uganda: A Pictorial. Peter Herbert OBE discussing racial bias in Britain's Criminal Justice System. A Ugandan UK Senior Ophthalmic Nurse has successfully coordinated the establishment of a comprehensive eyecare unit within Lubaga Hospital. The Eye Project Uganda, the initiative of Primrose Magala will conduct its second eye camp at Lubaga Hospital from October 14th-0ctober 18th 2018. Free cataract surgery (Adults and children), squint eye correction and conjuctival and eyelid growth excisions are among the services that will be offered at the eye camp. Primrose a nurse injector at Moorfields Eye Hospital expounded to the audience attending the ‘Uganda Independence Day Health Celebrations’ event at the House of Lords, the driving factors behind her decision to contribute to strengthening Uganda’s eye healthcare. Primrose (pictured below) was one of the panellists at the Uganda UK Health Alliance (UUKHA) organised event hosted on October 8th 2018 hosted by Lord Nigel Crisp (Co-Chair of the UK All Party Parliamentary Group for Global Health) with Uganda’s Ambassador to the UK Julius Peter Moto as main guest. Organised in celebration of Uganda’s 56th Independence Day (October 9th 2018), the event reflected on the benefits to Uganda and UK health institutions from healthcare collaboration initiated through UUKHA which was set up in 2013. The Eye Project Uganda is a UUKHA member. Ophthalmology (the branch of medicine and surgery that deals with the eye and visual system) Primrose said, is a neglected public healthcare service in Uganda and many treatable eye conditions eg lack of cataracts deteriorate to blindness. Magala said Uganda whose population is over 40 million people, has only 37 ophthalmologists while Moorfields (the first specialist eye hospital in the world) for example, has 400 eye specialists. The first eye camp organised by Eye Project Uganda and Moorfield Eye Hospital in London was held in November 2017 at Lubaga Hospital. Over 700 eye patients turned up at the eye camp. About 100 children underwent free cataract surgery and squints correction at the first eye camp. Primrose’s dream is to have an Eye Hospital established in Uganda. UK visa denials to Ugandan medics and other healthcare professionals invited to the UK for further training by their UK partners was aired as a key challenge for some partners. An audience member (during the Question and Answer session) noted how easy it is for UK healthcare professionals to “walk into Uganda” while no cross over exists for many “Ugandan partners invited to the UK”. “The doctors, psychiatrists from Uganda are being denied visas while we in the UK can easily walk into Uganda. One of the activities under our collaboration with Ugandan healthcare partners is that they too, come over to the UK. Collaboration is hampered when team members from Uganda are denied visas,” narrated the audience member. In response to the visa denial issue Dr. Tamara (Ugandan NHS Consultant Paediatrician) one of the panellists suggested for affected partners to at times, use modern technology like Skype, video-conferencing (and not discounting the drawbacks) to continue engagement with their Ugandan counterparts. “Uganda is not a dumping ground for used medical equipment. All those intending to donate such equipment should first contact the Embassy lest their equipment gets destroyed on arrival in Uganda,” he cautioned. Moto’s remarks were prompted by a question from a Ugandan UK Nurse who during the Q and A session, sought to know how ‘those that want to donate equipment from UK hospitals to Ugandan ones’ are supported (by Ugandan Government and UK healthcare partners) in shipping it. Ugandan media increasingly feature stories of donated equipment being obsolete, ending up unused in hospitals from lacking spares, being technically unadjustable to Uganda’s electrical system or not being accompanied with manuals. Under the collaboration between Uganda and UK health institutions, Ugandan biomedical engineers (they repair and maintain medical equipment) often come for further training in the UK. In the UK, I have met three Ugandan biomedical engineers that have benefitted from such training. The audience were told about the proposed Lubowa Hospital to offer specialised treatment for example for heart surgery, brain surgery, organ transplant, kidney surgery and cancer treatment and currently under construction. Eric Olanya Head of Trade, Uganda Department for International Trade (one of the panellists) said financing of up to $200m has been made available by a consortium of banks to finance the International Specialized Hospital of Uganda as the Lubowa situated Hospital will be called. He said the hospital is being constructed to stem the tide of Ugandans travelling abroad to seek very expensive medical treatment. However local media reports indicate land wrangles over the proposed hospital site as Buganda royals/Abalangira claim ownership of Block 269 on which it sits. The UUKHA through which Ugandan health institutions and UK ones are collaborating on strengthening Uganda’s public health has 5 thematic areas that the partners are focussing on. Quality and safety, educational development, collaborative research, leadership and governance and public health. UUKHA through which the partnership is enforced has 80 UK based participating members and 17 Uganda public and non-governmental/third sector members. Through UUKHA Gulu University and Gulu Regional Referral Hospital have a partnership with the University Hospital of South Manchester NHS Trust (code named GuluMan link). Through the links, medical interns and doctors go to Gulu Hospital and University to work and provide teaching support. A maternal unit was set up at Gulu Regional Referral Hospital through the link and one of the recognisable outcomes is the reduction in maternal and neonatal mortality. Ugandan UK Mental Health Registered Nurse Moses Mulimira (pictured ↓) has played a key role in organising UUKHA events in the UK, which bring together senior UK and Uganda medical professionals and health stakeholders. Moses Mulimira (left) coordinated the House of Lords-Uganda Health Celebrations event (courtesy photo). The Lubaga Eye Camp coordinated by Eye Project Uganda a UUKHA member is on from October 14th-18th 2018 at Lubaga Hospital.